Now that I'm on my home computer nothing looks different. Back on my iPhone using Safari again. The page layouts on this forum have changed dramtically. The boxes containiing subjects or replies are completely reconfigured. 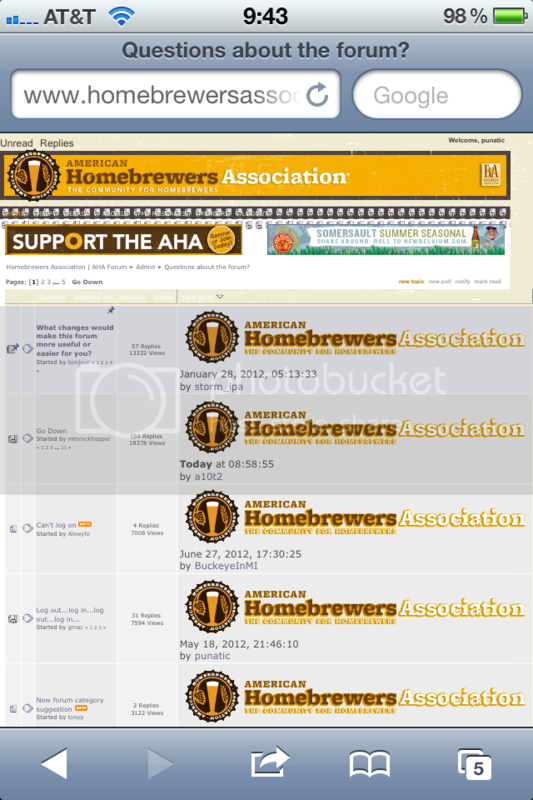 The function bar imediately above the Support The AHA banner appears as a series of small page icons with a jumble of different sized letters superimposed over them where the function hyperlinks should be. The page icons are small and numerous and look like lightbulbs on a Las Vegas show sign or something. Weird. If I knew how to capture a screen shot with my iPhone I would post it. As far as I know no settings have been changed in my phone's browser. All other web sites appear unchanged. No recent updates or settings changes made on this end. And oddly, I'm fairly certain they've made no changes here either. Yeah, I really don't think anything has changed on this end. Drew and I have a conference call with the AHA web team tomorrow about forum issues. I'll try to remember to ask. Back on my iPhone using Safari again. The page layouts on this forum have changed dramtically. Interesting... I'm on my iPhone (iOS 5.1.1) and everything looks the same. Menu button + sleep button takes a screenshot, btw. Is there an AHA forum iPhone app? Could it have been installed on my phone without my knowledge? The page on my iPhone used to look exactly like the page on my desktop until yesterday. I'd reboot your iPhone and see if that does anything. Hold down the sleep button until a slider pops up. I think I saw something briefly like that on my tablet a few months back. It appeared and then "corrected" itself. Can you set safari so that it isn't running as "mobile" and loads better pages as a desktop? Just had a meeting with Drew, Gary Glass, and Cindy Jones from the IT department. We've come up with a plan to identify what's causing the problem, which is the first step towards getting it fixed. I can't tell you how soon that might happen, but it's in the works as we speak and the AHA IT staff is taking the issue seriously. Thanks to everyone for their patience and I hope you won't have to wait much longer. So here we are over a year later and nothing has changed. My guess on how the actual conversation went was, "Just leave it alone. Soon they wiil accept the staus quo as the new normal and learn to live with it."